In his book, The Seven Habits of Highly Effective People, Stephen Covey describes a practical set of habits that can help you grow personally to become more effective. His seven habits represent a principle centered, character based, inside out approach to personal and interpersonal effectiveness. 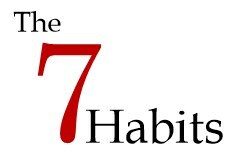 The Seven Habits also construct the stages of personal development. Covey’s approach is to have you focus on developing yourself as well as your relationships with others. He believes if the Seven Habits are integrated into your life, they will help you move through the stages of personal development. Dependence is where everyone starts in life. It is the stage where you are dependent on other people. You would be stuck at this stage without any personal development. Through personal development, you become more independent and take responsibility upon yourself. Interdependence is the stage were you embrace the idea of working and collaborating with others to achieve the best results possible. Covey’s approach is to move you progressively on a maturity continuum from dependence to independence then ultimately to interdependence. Covey uses the Seven Habits to gradually move you through theses stages of maturity. Rather than being dependent upon other people, or trying to be totally independent, you learn how to be more effective by working with others to accomplish your goals. As noted above, the habits are set up in a specific order to help you move through the stages of personal development. Since we are born into the dependence stage (having others do things for us), the Seven Habits begin by focusing on getting you first to independence and then moving you to interdependence. The first three habits in the book take you from dependence to independence. These 3 habits deal with self-mastery required for character growth to move from dependence to independence stage. Habits 4 to 6 center on teamwork, cooperation, and communication. These 3 habits move you from independence to interdependence. The final habit focuses to your overall continuous growth and improvement.